BERLIN, Germany - Despite international crises and the risk of political conflict around the world, as the 2015 holiday season begins the economic prospects for the global travel industry could not be better for the months to come. As ITB Berlin, the world's largest travel trade show, closes its doors the conclusion is as follows: boosted by falling energy prices, reduced interest rates, low inflation and positive economic forecasts for the eurozone and North America, the travel industry has high expectations as the 2015 travel season beckons. In Germany in particular consumers are keen to travel. Wage increases and a consistently stable employment market coupled with the falling cost of living have significantly increased spending. More than ever, this is why people are willing to spend their money on holidays. The luxury travel segment in particular stands to benefit. ITB Berlin, which came to an end on Sunday, was able to cement its position as the world's largest travel trade show. From 4 to 8 March 2015 10,096 exhibitors from 186 countries, more than two-thirds of whom were from abroad, were represented in 26 display halls which were fully booked. Overall, some 115,000 trade visitors (2014: 114,000) traveled to Berlin. The share of trade visitors from abroad increased to 43 per cent (2014: 40 per cent). These visitors also remained longer at ITB Berlin because they did good business, with the average duration of a stay rising to 2.4 days (2014: 2.1 days). According to estimates by Messe Berlin the volume of sales at the world's leading travel trade show increased from around 6.5 billion euros in 2014 to 6.7 billion euros. Dr. Christian Goke, CEO of Messe Berlin: "More than ever ITB Berlin fulfills the function of the world's leading think tank and a shop window for the travel industry. This is where the opportunities and risks are debated and the potential impact of the sharing economy on the international travel industry is analyzed. Over the past few days ITB Berlin has provided further evidence of how important personal exchanges and meetings between people are for an industry that is increasingly dominated by the digital transition." 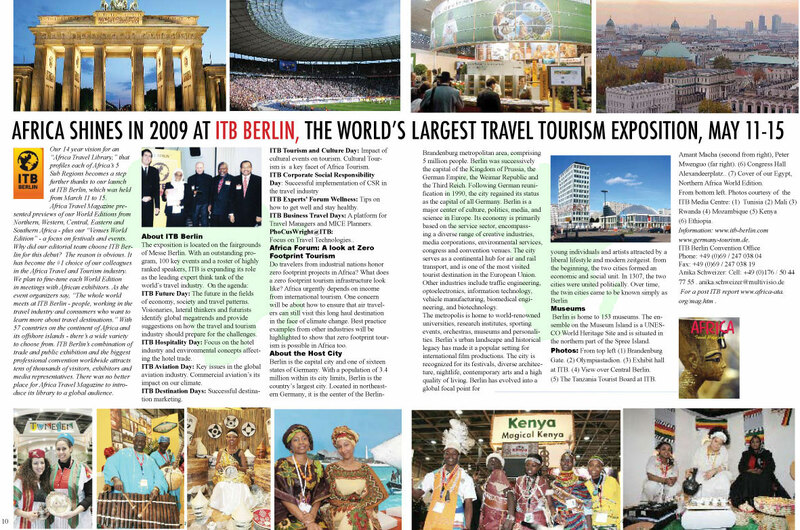 23,000 visitors (2014:22,000) attended the ITB Berlin Convention, another new record. Decision-makers and opinion-formers debated the key topics concerning the travel industry at a total of 200 events which took place in eight auditoriums. This year the focus was on the sharing economy which was the subject of numerous panel discussions and exclusive surveys. Marking its tenth anniversary, the ITB Hospitality Day had a success story to celebrate. Kenya's Tourism Board missed out narrowly to Rwanda at the just-concluded ITB 2015 but nevertheless lifted the runner up trophy as second best African exhibitor. The award will no doubt give an added boost to the confidence of Kenya's tourism stakeholders who had come to Berlin to market and sell the country. From first-hand experience while traveling along the Kenya coast, it is all but clear that the situation vis-a-vis room or bed occupancies is dire, and tourism policymakers and strategists have been scratching their combined heads in recent weeks regarding how to overcome market resistance and negative publicity and bring the crowds back to the award-winning beaches both south and north of Mombasa. "The market responses were giving us hope that sometime later this year things will begin to improve for Kenya," said a regular source before adding, "We may have another tough year ahead, but there is now some light at the end of the tunnel. Interest from around the world was very keen, and we built on the relationships we forged when we brought hosted buyers to our Magical Kenya Show. The same will happen again this year and KTB [Kenya Tourism Board] will also host more travel writers and journalists to tell the world of their experience when they visited. The Recovery Taskforce has handed in their report, and we expect that key elements will be approved by government very soon. We have waited for long about the VAT issue, traffic rights to Mombasa, and so much more that it would be too much to list here. "As for me I agree with you that we need to reform the tourism act and bring all those parastatal bodies under one roof. What we now have is wastage, several authorities or agencies, and they all have the same back-of-house functions five or six times? That should change, and then we need government to put [its] money where [its] mouth is and fund KTB properly. We have seen and shown what we can do with money, and we just have to invest in a media blitz and e-campaign to get our old markets back. All those tourists surely had a good time, we want them to remember and come back again." With visitor numbers in 2014 once more down compared to an already depressed 2013 - final figures are still not available for the full calendar year - big challenges await Kenya's tourism sector to put a new sheen on. Product upgrades is an issue raised time and again, as are niche markets which could bring in higher spenders, while for instance coming to play golf in Kenya. The full opening of the English Point Marina will no doubt also add another attraction to have yachting enthusiasts take a fresh look at Kenya as a second home, and the various festivals and events, when properly packaged and marketed, will also help to showcase the country as a revitalized destination. "As long as security is assured, and there are no more lapses, we should be well on the road to recovery from winter 2015 onwards. Campaigns, however, must continue throughout 2015 and 2016 to avoid the mistakes the last government made when they thought that the elections would not be a factor in tourists' decisions where to go. It is a factor, and we need to for once get ahead of the ball rather than continuously drop the ball as we have done in the past," added another regular contributor. Time will tell which way Kenya's arrival numbers will go this year, but in the meantime this correspondent's tour along the coast moves from Malindi to Watamu, an area renowned for the many conservation activities and projects by both local residents as well as NGOs. Asmara - Eritrea is taking part in the annual International Tourism Exhibition in Berlin, Germany, for the 10th time, according to the Eritrean Embassy. Eritrea is staging a pictorial show at the exhibition featuring the nation's natural resources, culture and values, in addition to food, works of handicrafts and traditional coffee ceremony, among others. The Exhibition organized by the Eritrean Embassy in Germany was inaugurated by Mr. Yohannes Woldu, Charge d'affaires in the Eritrean Embassy in the country. Moreover, pamphlets and posters by the Ministry of Tourism and the Eritrean Embassy highlighting the nation's tourism resources are being handed to visitors of the exhibition. Berlin International Tourism Exhibition is one of the world's major shows, and that a total of 10,000 tourism institutions from 180 states are participating in the current exhibition. According to reports, last year the show was visited by a total of 115 thousand individuals. (1) Grand succès de la 19e édition du SITV. Dionne. (2) Tunisie : Kaberuka annonce le premier satellite africain . Tunisie . Our 14 year vision for an "Africa Travel Library," that will profile each of Africa's 5 Sub Regions, comes a step further with our launch at ITB Berlin. 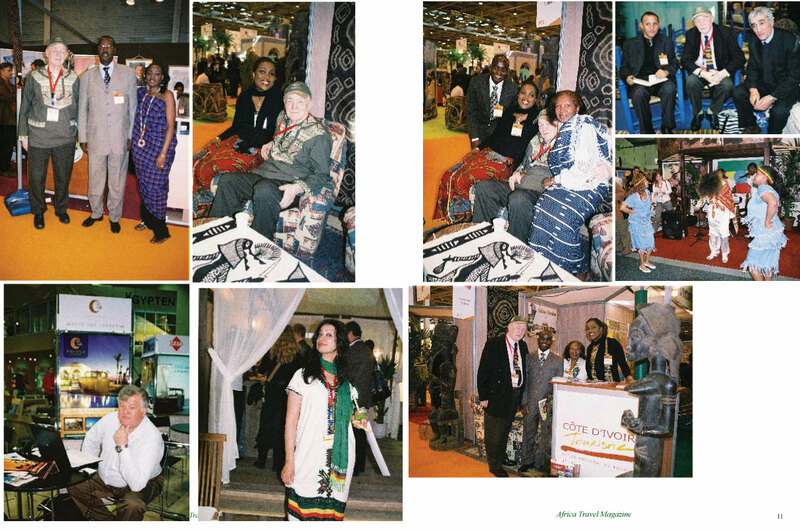 From March 11-15, 2009,Africa Travel Magazine will be presenting previews of World Editions from Northern, Western, Central, Eastern and Southern Africa - plus our "Venues World Edition" - a focus on festivals and events. Why did our editorial team choose ITB Berlin for this debut? The reason is obvious. It has become the #1 choice of our colleagues in the Africa Travel and Tourism industry. We plan to fine-tune each World Edition in meetings with African exhibitors. As the event organizers say, "The whole world meets at ITB Berlin - people, working in the travel industry and consumers who want to learn more about travel destinations." With 57 countries on the continent of Africa and its offshore islands - there's a wide variety to choose from. ITB Berlin's combination of trade and public exhibition and the biggest professional convention worldwide attracts tens of thousands of visitors, exhibitors and media representatives. There's no better place for Africa Travel Magazine to introduce its library to a global audience. The exposition is located on the fairgrounds of Messe Berlin. With an outstanding program, 100 key events and a roster of highly ranked speakers, ITB is expanding its role as the leading expert think tank of the world's travel industry. On the agenda:ITB Future Day: The future in the fields of economy, society and travel patterns. Visionaries, lateral thinkers and futurists identify global megatrends and provide suggestions on how the travel and tourism industry should prepare for the challenges. ITB Hospitality Day: Focus on the hotel industry and environmental concepts affecting the hotel trade. ITB Aviation Day: Key issues in the global aviation industry. Commercial aviation's its impact on our climate. ITB Destination Days: Successful destination marketing. ITB Tourism and Culture Day: Impact of cultural events on tourism. Cultural Tourism is a key facet of Africa Tourism. ITB Experts' Forum Wellness: Tips on how to get well and stay healthy. ITB Business Travel Days: A platform for Travel Managers and MICE Planners. Do travelers from industrial nations honor zero footprint projects in Africa? What does a zero footprint tourism infrastructure look like? Africa urgently depends on income from international tourism. One concern will be about how to ensure that air travelers can still visit this long haul destination in the face of climate change. Best practice examples from other industries will be highlighted to show that zero footprint tourism is possible in Africa too. Berlin is the capital city and one of sixteen states of Germany. With a population of 3.4 million within its city limits, Berlin is the country's largest city. Located in northeastern Germany, it is the center of the Berlin-Brandenburg metropolitan area, comprising 5 million people. Berlin was successively the capital of the Kingdom of Prussia, the German Empire, the Weimar Republic and the Third Reich. Following German reunification in 1990, the city regained its status as the capital of all Germany. Berlin is a major center of culture, politics, media, and science in Europe. Its economy is primarily based on the service sector, encompassing a diverse range of creative industries, media corporations, environmental services, congress and convention venues. The city serves as a continental hub for air and rail transport, and is one of the most visited tourist destination in the European Union. Other industries include traffic engineering, optoelectronics, information technology, vehicle manufacturing, biomedical engineering, and biotechnology. Berlin is home to 153 museums. The ensemble on the Museum Island is a UNESCO World Heritage Site and is situated in the northern part of the Spree Island. Photos: From top left (1) Brandenburg Gate. (2) Olympiastadion. (3) Exhibit hall at ITB. (4) View over Central Berlin. (5) The Tanzania Tourist Board at ITB. Amant Macha (second from right), Peter Mwenguo (far right). (6) Congress Hall Alexandeerplatz.. (7) Cover of our Egypt, Northern Africa World Edition. For a post ITB report www.africa-ata.org/mag.htm .